Who the hell are you, Skeeve? I'm a 38-year-old National League (ex-Conference Premier) analyst. I've studied sociology and worked as a journalist, a copywriter and a screenwriter before I became Skeeve full-time many years ago. Skeeve was the name of a character in a fantasy novel 'Another fine myth' written by Robert Asprin. It was the first nickname I could think of when I had to choose one for a forum registration back in 2005. Asprin's Skeeve turned out to be quite good at magic as well. Since when have you been analysing non-league football? It feels like yesterday. Since 2006 though. One of the best out there. Not my words. If you want the numbers, I've made +687 points profit with 1569 picks in twelve consecutive profitable seasons, at a 12% ROI and a 754% ROC. What's your staking policy? Are you using a 1-10 point scale? I'm currently using a 0.5-4 point scale (four points per asian handicap bet / one point per outsider bet) and recommending a forty-point bank (the advised bank was 100 points until May 2010, 80 points until May 2014, 60 points until May 2017 and 50 points until May 2018). My season starts in mid-October, when the first third of the games have already been played, and ends in mid-May, after the play-offs (I'm only recommending half of the usual stakes before January, so two points per asian handicap bet / half a point per outsider bet). When are you sending your picks & previews? Saturdays (match day), 10:30 AM UK time. I've heard you're not getting involved with the midweek games at all? I'm not (since 2012). Midweek non-league games have proved to be way too unpredictable. So, you're covering the National League (ex-Conference Premier), right? Why Conference? Why not Premier League, Championship, Swedish hockey, Ukranian volleyball? Because I've been following the English non-league world for quite a few years now and I know all there is to know about every team in the Conference, so I'm simply sticking to what I'm best at. Who can guarantee these are actually the right stats? I was posting my non-league picks & previews on my old blog, on the Betting Advice forum, on the ex-Punters' Paradise forum (I was a resident tipster there) and on the Laka Lovica forum (I was a moderator there) from December 2006 until September 2007 and all of the picks starting with October 2007 have been independently monitored and verified, by the Betting Advice surveillance team from October 2007 until May 2010, by the highly rated Smart Betting Clubsince March 2008, by Joseph Buchdahl's Sports Tipsters from August 2012 until it's closure in June 2015 and by BetRush since October 2016. What about your picks? Do they come with a match preview or are they just plain picks? All of my picks come with a detailed match preview. I'll even find out where you can find the best odds, second best odds and in fact any odds that in my opinion offer value at that moment - and I'll add an oddsportal link so that you can compare the odds yourself. Can I get the recorded odds? How does that work in reality? You can get even better odds. Not only do I record the odds with Pinnacle (if the bet isn't available with Pinnacle, it by default can't be an official pick) or SBO only (which means you can sometimes find better odds with other bookmakers, some of which are 188bet, 5Dimes, Bet365, BetVictor, Coral, Dafabet, Ladbrokes, Marathon, Unibet, Will Hill...) - the recorded odds are those available with a sixty-second delay, when they're usually at their worst, as the odds bounce back much more often than not. 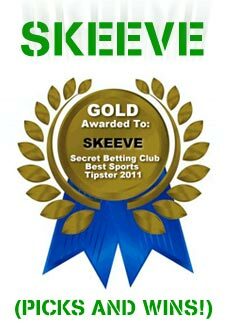 Excel sheets with pre-mail, recorded and closing odds are available to all Skeeve Picks clients. Where can I compare the odds? Would you be interested in exchanging some clients? My service has about 2000 clients that has paid atleast once to our service. Would you be interested in trading client email list so that we both can benefit in our business. It is a good opportunity for both our clients and us as well. Let me know if you are interested. We can both get lot of extra exposure and sales by doing this. Please get back to me and let me know what you think. I UNDERSTAND THAT THERE IS A MORAL DILEMMA WITH THIS METHOD BUT AS LONG AS WE DONT SPAM IRRESPONSIBLY IT SHOULD BE OK. WE SHOULD WORK TOGETHER TO GET SOME EXTRA CLIENTS. Do you want buy fix match? It's 1000% true, no scam, I make many mony on this. Trust me. Bloody hell, that's a horrible run in the last few months. Have you ever experienced anything like it in the past? You really are the best. Amazing picks lately! What's your secret? A bit of talent (I guess), plenty of hard work and some experience as well. It's not always like this though - I'll have some bad runs as well. How much does it cost to join the service? It's 600 EUR for the whole season. Not at the moment, but feel free to send an e-mail if you want to be on the 2019/20 waiting list. Good. Don't hesitate to ask.